What’s your 40? this is a wildly popular question among scholastic aged athletes today. Speed is made up of two components-stride frequency and stride length. To run faster you must improve your stride frequency and/or your stride length. Below I will look into the benefits of both and give you some tips to run a faster 40. Stride frequency is most trainable in grade school. Joe Defranco, world class trainer who has worked with and drastically improved many of his clients 40 yard dash times states that “Stride frequency is most trainable before an athlete reaches puberty.” This is because during this time their nervous system is still developing and it can be “molded” like clay. He also states “that the athlete that takes the fewest steps-stride length-usually wins the race. In 2012 Usain Bolt won his 2nd 100 meter dash gold medal by taking 41 steps to complete the race, compared to the rest of the field who took between 44-46 steps. Personally, coaching high school track in the state of florida for the past 12 years rarely have I seen a freshman boy dominate the sprints. Only after he matures and is exposed to a proper strength and power program does the athlete begin to realize his potential. Typically this happens in the the later years,thus why you see year in and year out seniors dominatting the sprints. Considering all of this, it would be of the most benefit to focus on improving stride length to improve your 40 time. To improve stride length you must get stronger and learn to apply more force into the ground. Traditionally coaches focus on the big 3-Squats, deadlifts and the Bench Press. These exercises are great and do wonders for improving your strength(when done correctly) but by incorporating some sled work into your program you will mimic acceleration mechanics that are required at the start of the 40 yard dash and get stronger at the same time. Two exercises that will help develop this strength and at the same time teach proper acceleration mechanics are prowler marches and heavy sled drags(prowler marches are not prowler sprints). Both of these exercises force the athlete to have a forward lean and apply force into the ground at the same time. The forward lean puts the athlete in proper position to accelerate at the start of the 40 yard dash while at the same time getting stronger and learning how to apply the necessary force into the ground to run a faster 40. 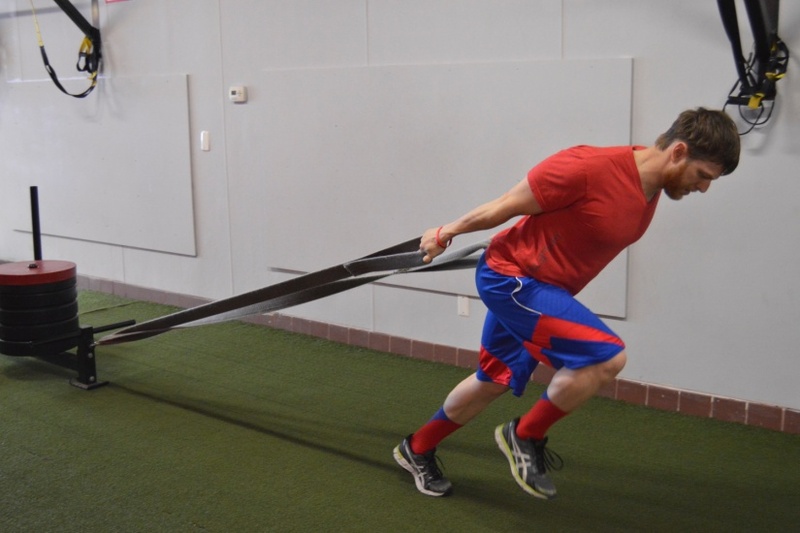 You don’t need an expensive/fancy sled to realize the benefits of these great exercises. You can attach a rope through a sandbag that can be loaded with as much as 300 pounds. Sandbags are extremely versatile and provide an excellent training stimulus for sprinters. Another example is the use of kettlebells. Simply loop a heavy rope through the kettlebells and pull away! An often overlooked component of speed is flexibility. Often times or I should say 99.9% of the time athletes lack the proper flexibility to be able to extend from the ankles, knee and hip thus limiting the amount of force they can apply into the ground. Think about it, if you can’t extend fully extend at the hip, knee and ankle joint how can you apply maximal force into the ground? So spend a few minutes each day working on your flexibility/mobility…your 40 time will benefit. Optimizing your 40 time is a blend of work and know how. As your strength and flexibility improve so will your 40 time. Don’t let anyone tell you that you can’t get faster because you can. Work hard and watch those 40 times drop!